Incidentally, this is Best Bet time of year isn't it? I've got one for you guys. Domingo. I don't know why it took me this long to realize I should do this, but here we are. I see absolutely no evidence to disuade me from the thought that Domingo is going to be a minor star for the Mariners this year. Let's call it >2.5 WAR this year, next year, every year. 90% confidence. Does that meet the definition of a Best Bet? Doc? Anyone? Q. Is Santana's defense going to cost him 1-2 WAR per year? A. I'd bet long against it. “And ‘pretty good athlete’ is an understatement. He’s 6'5, 230 and I think I’ve mentioned this before — per Statcast data, our fastest player is Dee Gordon. Our second-fastest player by a hair, in back of Dee Gordon, is Mallex Smith. 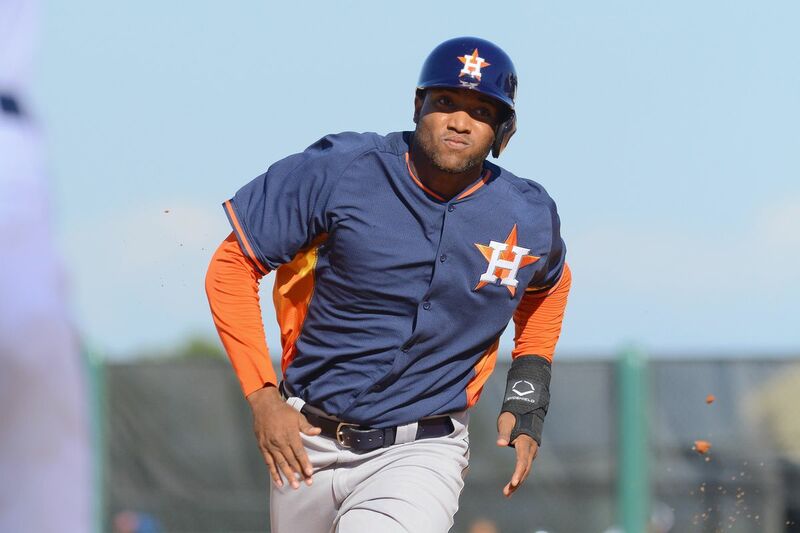 And our third-fastest player is Domingo Santana — in terms of how much ground they cover. I realize it's possible for a man with blazing-fast speed to play LF with such horrific instincts that he's below average there, but I'll take your money if you want to bet that way. UZR has Santana at -10 runs per year or so thus far, but John Dewan has him plus. I'll bet that in 2019 Santana turns up at least middling when you amalgamate the numbers on him, esp. the M's numbers. Why? Again, left field isn't rocket science, and Mallex Smith speed does make up for a slow first step, enough to cancel you into "mediocre." What's to cause minus 10 runs?! Q. Is there anything wrong with his swing path? A. HQ makes a big deal about his GB rate zapping his HR totals. True, if there were something that made me a little skittish it might be this, since his GB/FB is 1.7 lifetime (1.1 average). On the other hand, a guy hitting 25 HR's a year -- Santana's average already -- with a high grounder rate is a topspin hitter. That's a T-Mobile hitter, a Raul Ibanez antecedent who safely banks an extra +10 OPS in the home park (because the topspin defeats the hot-air popcorn swirler). One of the early lessons I was taught in scouting is, we’ve got the little stop watch, and we time runners running to first base to try to get an estimate of their foot speed. It’s not always perfect, but it’s an estimate of their foot speed. If a runner gets to first base in 4.2 seconds, he’s roughly an average to an above-type runner. 4.0, you’re movin’. Go back and look at O'Keefe's article and there are several .gifs of Santana hitting moonballs with 7-sec hang time - to center field. Possible, maybe probable, that Santana's GB rate will smooth out towards 1.1, creating a major threat to the 40-homer club (his PX is consistently 145). But even if it doesn't it will have him banking extra singles and doubles in T-Mobile. Q. Why would the Brew trade him? A. A starting 3 in the OF, and the desire for a man (Gamel) with 4th outfielder makeup, we s'pose. Sherm bids "90% chance at >2.5 WAR year after year. M's 2nd-best player." Pretty early in the year, too. Anybody wanna compete with that? Haven't looked good to me. I'm only sitting on about 5 televised games where the lineup was generally all 3 PA max per. I was hoping it was a spring thing but some numbers seemed to back it up. Can he improve if he actually has been that bad? I don't fully trust any defensive metric anyway. Yeah, that bat at DH with Lewis, Kelenic and Rodriguez trumping Dom Santa's athleticism is one of the possibilities I've seen. 15 teams may be in the market for a DH in a matter of months, so I'm also thinking he doesn't stay that long. Might need to rotate Haniger with 3 other OF through DH for 2 or 3 years if 3 of the 8 or so to watch in the minors do click. I'm not going to suggest he's second best on the team but 2.5+ WAR seems still conservative enough to me. If it is reads and they are able to help him improve them or the numbers are funny now anyway he could go way beyond. I'm waiting to see the plus arm. Santana comes to the plate with the bases loaded and I say in chat "oh look, it's our best power hitter". Doc inquires what people think and the roundtable give generally positive reviews...lots of optimism. My answer. "I have him penciled in for 35-40 HRs this year." I'm probably the most bullish here. He doesn't quite have boomstick-level power (batted ball velo is lower by several mph) but he's on the second tier in terms of quality contact and his numbers are skewed by what, imho, is a temporary issue with grounders. 2.5 WAR is the floor for me and that would be if his defense actually was bad. Which I'm not convinced it is. That's a Trump-bidding-on-his-own-portrait level raise! Glad I'm not the farthest out on the limb here, Matt. 37 homers would be something, and would represent the highest return imaginable for a 4th outfielder. How much WAR do you think UP Domingo is worth, if he hits thirty-seven bombs? 5-6, I would think? The reason I'm so bullish on Domingo is that all of his strengths look ironclad, and the few weaknesses all have mitigating factors. He's a 110 OPS bat, bare minimum, has been since he was 22 in 2015. He's fast enough to run the bases well. His power is to the opposite field, always a strong sign of a balanced hitter. He walks 60 (last year, when benched and unhappy) to 100 points! The ground ball tendency is A. the sign of topspin, B. probably changeable in the modern age of launch angles, and C. clearly not keeping him from being a quality power hitter. Also, his homers are moonshots so he's obviously not having a problem getting under the ball when he gets his pitch. His defense is bad, maybe, and he does look like he probably has bad instincts. But poor jumps/routes + good speed + good arm = a perfectly decent LF right? Like Doc says, it's not rocket science. If he's giving away 1WAR per year based on routes alone, he'd have to be Nori Aoki out there. No wait, I looked it up, Nori lost 0.4WAR per year to defense, on average. And he's the single worst route-runner I've ever seen. So I'm lost on how Domingo could be that bad. Mike Morse he ain't. He broke out in 2017, had 2.9WAR. Next year played 1/3 of a season, had 1.0WAR. He's been producing at a >2.5 rate for two years already. He was fine at 22, now he's 26 with experience. Add it all together and you've got a guy whose statistical floor appears to already be a bit over 2WAR. Every single bit of window dressing is trending up. If that's not what a best bet looks like, I don't know what is. He's not a LF. I'm saying Lewis, Smith and Haniger make him look like a 1b/DH. We have also gotten a review of the possibility of Haniger CF, so maybe Smith would be the one to go especially if Lewis has it all back and locked up CF for most of the 20's. Rodriguez and Kelenic could soon push it even further, where Haniger might seems like the guy to DH or trade for better value. Finding out about Mitch and 'Mingo's ability to DH in this year to have a better idea for the future would be a good idea. Also because, if I haven't said it too much already, the NL teams may be looking for DHs in November or even at the deadline if they need a bat this year or are feeling proactive. Isn't that the dream OF here in the 20's, K-Lew, J-Kel and J-Rod? I'm not saying to count chickens, but that Lewis should be hatching this summer. Our current OF seems temporary in that respect but DH hasn't been seized yet. But absolutely work on the defense. Even if they only get temporary improvement from him before he's moved, that improvement (or defensive stats shooting up) could improve the return. Not saying he has to be. Though taking the odds on Dipoto trading anyone my answer is "Yes". Feels like I'd be right more often than not. My knee-jerk reaction is that Domingo's bat profiles fine at DH, and we may have a vacancy there by midseason, give or take Vogelbach. But Haniger would be wasted at DH. Leave him in an outfield corner or you'll be deploying the most defensively overqualified DH ever. At the end of that sentence is to say this development staff seems clearly superior in every way I can think of to any here before. Edit: I get that there's flameout and injury but many of the things they're implementing are attempts to improve that. I believe the improvements with bio and numerical analytics, technology and medical understanding teams could actually have higher success than they used to. Especially this team. The OF is already a potential situation with Lewis this summer. I'd figure rotating 4 OF until you're confident Lewis is ready and you're moving someone. Smith would be the other choice to move, or Bruce at the least if Smith is 4th OF and Bishop is also out of the picture for some reason. Things happen, there's no certainty. I've got more hope now even after the failures of generations passed because of the things I know they're doing now. We do have more access to prospects today, via social media and more media in general. We can watch prospects do things without going anywhere, although defense is often much harder to find than a HR or stolen base. I see steps forward with pitchers, fielders, hitters throughout the organization more frequently the last couple years and they're producing real stats more frequently. It's not a scout's eye telling me he has a skill that can be great in the game but actual utilization of skills producing wins. I did mention possibly trading Haniger instead to get more value, because I understand some of his value would be wasted. But he might only be DHing 2 days a week if it's cycled to rest several and keep 4 nice OF bats. Compared to Nelson Cruz over the last 2 years + 1 game that is. Cruz gets the higher ISO, but Santana gets the higher BABiP, probably because Santana gets an extra 10 percentage points of line drives (Cruz has been a 18/43/39 split on LD/GB/FB contact, Santana has a 27/45/28 split). I've pointed this out before, but future MVP Tim Beckham also makes pretty fantastic contact on his batted balls, a notch below Mitch Haniger but just better than EE. ...that the mariners were we're lo at precisely those sorts of numbers (ball in play results) when they picked up Santana and Beckham. Yes, Santana gets more line drives, so that'll help keep his batting average up, though he also strikes out way more than Cruz. Still, I think offensively you got at least 85% of a Cruz here. He does appear to get very bad reads in the outfield, but UZR is a bad metric. The more I see of UZR the more I think it's utter trash. StatCast thinks he's been basically average in left field. And that's accounting only for catches...he also has a cannon arm. Someone asked what the upside WAR was. I'd say five or so. Haniger does more things well than Santana when going well. Six wins might not be his ceiling, but I won't assume anything higher and I'll shade Santana down a bit from that. Santana is a moving target...and the movement has been entirely in one direction, leaving out the Brewers benching him for no good reason aside from the whole...acquiring two studs thing. I was tempted to call UZR a RNG when I was looking at some others recently. I don't think it's close to that bad but it seems like it in some cases. 1. “Down goes Frazier! Down goes Frazier!” ”Boom,” went Foreman’s right; Frazier was KO’ed, punched out. And let’s be pretty clear, Santana gets punched out a whole lot More than Frazier! BiG time! His 32% career K rate is basically atrocious. Last season only 3 qualified big-leaguers exceeded that; Chris Davis (not Kris Davis), Joey Gallo, Yoan Moncada. But to tell you the truth, gimme some Joey Gallo+ from Santana and I am a happy camper. And the next five guys after Davis, Gallo and Moncada were Teo Hernandez, Giancarlo Stanton, Chris Taylor, Justin Upton and Kyle Schwarber. Not a terrible quintet. 2. Santana hits the ball too far to not be productive if his K rate doesn’t get worse. His misses will get out of the park. Well, let me rephrase the first statement: If his K rate gets any better, he has to be decent. 3. He BB’s at an above average rate. 4. He’s a much better bet for a pretty package of trade return then EE is, which recognizes the bunch of young OFers we have coming. 5. I am a Gamel fan. All the same, the Brewers wuz robbed. Santana's swing mechanics give me nightmares. Ignoring the potential for back/oblique troubles from his upper-body contortions during followthrough, it just looks to me like he's got too much length in his swing to generate consistent contact (which is how his stats show: lots of K's to go with his big-time power). But seriously, the only reason I can see that the Brewers wouldn't keep him is that they had character concerns. Which doesn't track with the M's acquiring him after basically giving Segura away for free due to the same issues. So what gives? Sure, the M's lost a year of control time by swapping Gamel and Santana, but anyone in their right mind (looking *purely* at the stats) would choose Santana over Gamel every day of the week and thrice on Sunday. I'm not as bullish as some here. I think that Santana is probably going to end up as a DH because he's a long-bodied man with more Vlad Guerrero in his movements than Mike Cameron. His body isn't likely to age all that well, to my mind, but he'll definitely be able to play the field (and I agree with those who see him as an average defender in left) for several years, during which time it's going to be hard to imagine that he doesn't solidify himself as a 120 bat. That's gotta be good for 3+WAR at his peak, like a right-handed Raul Ibanez with a bit more defense entering his prime. I'd take that projection right now.